For this third example, you will learn perhaps your most useful run: the one octave triplet run. 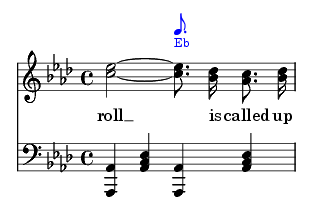 This run will be placed on the first measure of the chorus, on the word “roll”. 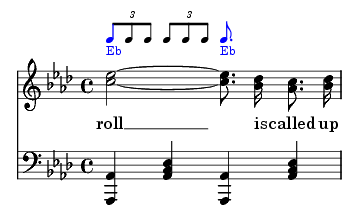 The target note is Eb, on the third beat of the measure. Notice that, in each of the previous runs, the run ended on the next word or note. 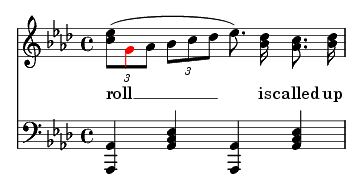 In this case, however, the run only takes place during the one word, “roll”. Again, the evangelistic style almost demands a triplet run! You only have two beats to complete this run, since the target note is exactly on the third beat. 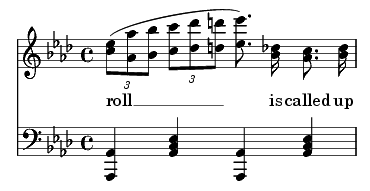 Therefore you have 5 notes to add (the first note of the measure, Eb, is not considered part of the run). Five scale tones from our target note (Eb) are: G, Ab, Bb, C, and Db. Now the underlying chord for this measure is Ab, which does not blend well with the starting note of the run (G). Therefore, you must move the first note of the run up to Ab. Compensate for this by adding chromatic steps at the end of the end of the run. Now your run should be: Ab, Bb, C, Db, and D. This leads nicely to the Eb of the third beat, an octave higher! As always, the evangelistic style runs sound best in octaves, and work best when playing the right hand in octaves.